Check our product pages for available sizes. Safe zones for images and content that you don't want trimmed off are 1/8" (0.125") inside the final size of your printed document. 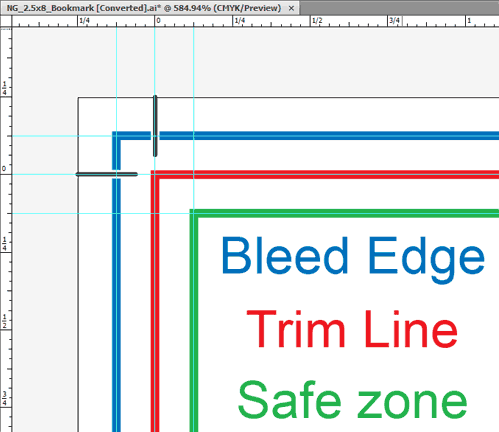 Bleeds should extend 1/8" (0.125") beyond the trimmed edge. Please include crop marks to indicate final trim area. If your art files reach or exceed 300MB there is most likely something wrong with how you produced your file. Please revist the product page you are building the art work for and review the requirements for that product. If you have questions about problems you are having with your print file please email your question to our offices and someone will contact you to try and help you resolve the problem. Your images and designs should be saved to 300 dpi at 100% of the dimensions (1:1) at which they will print to ensure high quality printing results. For large format printing files should have a resolution of 150-200 dpi at 1:1. As a rule of thumb, the larger the format the lower the resolution should be. Billboards can be reduced to as low as 22-55 dpi at 1:1. See Understanding Resolution for more info.